A popular option is to have your home contents packed professionally ready for move day. Our great value packing service really takes the physical and emotional strain out of your house move, speeds up the process for you, and ensures the safe transit of your belongings. We use high quality packing materials including reinforced cardboard boxes, wrapping paper, bubble wrap and wardrobe cartons. Our specially trained packers will come to your home prior to your move to pack and organise your belongings so that everything is ready to be loaded onto the vehicle on move day. We can tailor the service to your individual needs, and will pay special attention to fragile glass and china, electrical items, antique and highly polished furniture and framed pictures. If you opt to pack yourself, Sussex Removals can give you advice, and provide all the boxes and materials you need. Sussex Removals is proud to be registered with Checkatrade.com with over 600 reviews. Once again we have had brilliant service from these guys - we move a lot and they are the only company that we have used more than twice! Friendly. Helpful. Professional. Will be using Frazer again! Moved from West Sussex to Barcelona. Very good service from all concerned. The removal guys were so friendly and professional that we were very happy to leave them to pack up our house whilst we drove off to Scotland. When the items reached our new home, we found them to be packed carefully and in good order, making unpacking an easy job for us. 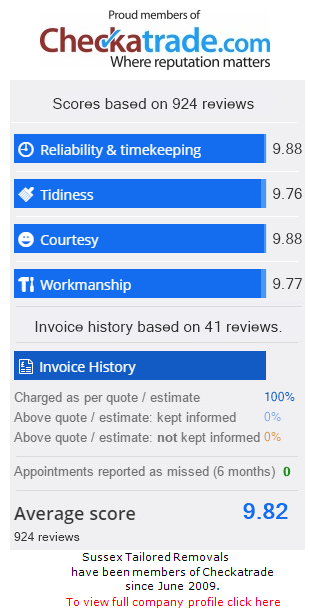 The price of the service was also extremely competitive and far better value than the *big* removal firms. We would definitely recommend Frazer and the team. Removals from Sussex to Scotland. Frazers team were both polite and professional throughout our move, reliable, clean and efficient. I would highly recommend them to anyone in need of a removals team. Frazer and his team did a fantastic job. Nothing was too much trouble and the guys on the day were very professional and very organized in what they were doing. They made the move a really easy process and we would definitely use them again. We have already recommended them to others that are looking to move. An excellent service that took a lot of the stress and hassle out of our move: we decided to go for both the packing and moving service and it was the best thing we did as everything was expertly packed for us (which with an 11 month old was a real benefit). The team were excellent headed by the amazing Pete who was so helpful and willing to make suggestions and help us with all of our plans- we can't recommend them highly enough. Could not have asked for more - polite, clean, courteous, and made what would normally be a very stressful day, stress free, and they showed fantastic patience whilst we were waiting for keys for new property and really appreciate this. Would totally recommend Sussex Removals Ltd to anyone moving home, based on quality and price. Excellent job, carried out over a three day period by Frazer and his professional team. It can't have been the easiest removal job since we were moving from an old cottage with very low ceilings and entrance but the friendly, courteous and very helpful team carried out the work with efficiency and a smile! If you are looking for a removals firm with a price in the "middle" area of quotations, then Sussex Removals should be your choice. Have no hesitation in recommending them - in fact I already have! Very impressive organisation. The move was faultless-staff well trained and managed, hard and tidy workers, carefull and helpful. Time scales were met every time. My furniture and possessions [I packed the 'smalls' myself] were carefully protectively wrapped and packed onto the two trucks used and with experience and care.I have a large collection of valuable pottery and no damage at all. A cost effective and efficient Company-I would use again. If you choose Sussex Removals Ltd you will be in safe hands. Removal from Sussex to Mid Wales. I had used Sussex Removals before, based on the great service I had, they were my 1st choice for moving house. Frazer was so accommodating as the completion dates kept on falling through and remained a moving feast until the very last. They continuously adjusted their busy schedule in the lead up the X-mas to fit me in. When it came to the packing and removal, it was all very straightforward and the team worked diligently to pack, store and move on the day with some large and awkward furniture that needed dismantling and reassembly taking them late into the evening. Really grateful, thanks. Would highly recommend this company, who were recommended to me by a neighbour who had used them. Excellent team who work together well. Great advice and help prior to the move which eased the stress of moving. On the day they were punctual, polite and efficient and covered our carpets etc and were careful when moving the furniture and boxes. I would highly recommend this friendly and professional team. Very pleased with the service received. Frazer was very professional and helpful, especially as it was very last minute. His boys turned up promptly on the day, removed all our possessions quickly and efficiently, and were polite and courteous. Before we knew it all the boxes had been placed in our desired rooms and the job was done. I thoroughly recommend them and would definitely use them again. What can I say! Excellent! This was not a conventional/simple move. I completed on the 14th August, while Frazer and his team took all my belongings into storage for over two months. Everything was treated with upmost courtesy and professionalism. His team kept me updated with emails and telephone calls. Invoices were always prompt and well explained. They even allowed me to come down and see my belongings in storage and gather some winter clothes. What Sussex Removals Ltd do is supply a complete and amazing service! Right from the arrival of a friendly face in Mike to a reliable service. Excellent! Just wanted to say what a fantastic job your removal team did - nothing was too much trouble for them and I know they worked really hard to move a lot. Will is probably moving again within the next 18 months and we will be using you as it is great to find a service provider who delivers and is easy to work with. We have a large circle of friends in the area and we will be recommending you. If you have other potential clients who want to speak to people who have used you then I am happy for you to give them my number.